The Marvel Cinematic Universe is expanding into books with the release of Thanos: Titan Consumed. The book is the first of its kind for the MCU and will be an official tie-in canon story to compliment the upcoming Avengers: Infinity War and flesh out the villain before the release of Avengers 4. The Russo Brothers recently revealed that they had cut out Thanos' origin story from Infinity War due to pacing issues, so fans who were disappointed in that news can rest easy knowing that an official book with tell the story. Thanos: Titan Consumed, by Barry Lyga, is set well before the events of Infinity War and will tell the backstory of the super villain. The story will take place before Thanos became all-powerful, when the Mad Titan was born on a "doomed world" and cast aside by its inhabitants. The story will go into details about the motivations behind Thanos' actions in Infinity War. The official synopsis for Thanos: Titan Consumed reads as follows. "Space. Reality. Mind. Power. Time. Soul. Before creation itself, there were six singularities. Then the universe exploded into existence, and the remnants of these systems were forged into concentrated ingots... Infinity Stones. Only beings of immense power can hope to wield these stones, but for those who are worthy, the powers of a god await. Thanos is one such being. But he wasn't always. Born on a doomed world and cast out by his people for his genius, physical deviancy, and pragmatic but monstrous ideas, Thanos is determined to save the galaxy from the same fate as his homeworld... no matter how many billions have to die. Learn the origins of the most formidable foe the Avengers, the Guardians of the Galaxy, Doctor Strange, and Black Panther have ever faced-a foe whom even a group of remarkable people, pulled together to fight the battles nobody else could, will fail to stop.... Dread it. Run from it. Destiny still arrives. Thanos is here." 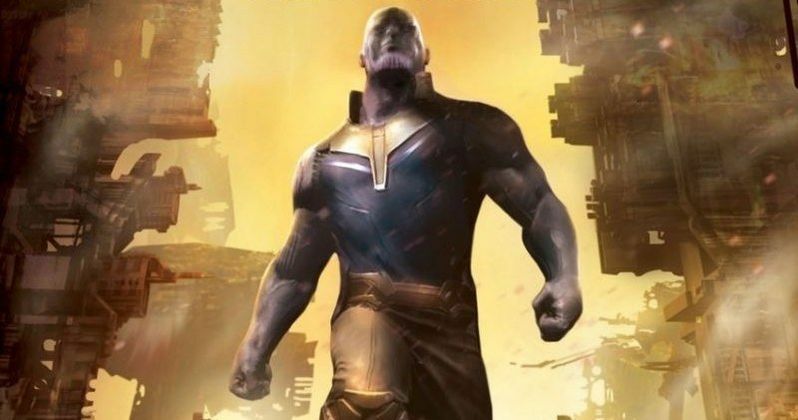 Thanos: Titan Consumed author Barry Lyga recently spoke about the book and how he had to "reverse engineer" what we know about Thanos from the MCU in order to write the book. The author admits that he wanted to make the book a true companion to what Marvel fans have seen on the big screen. Overall, Lyga is really excited about the book and proud of what he's been able to achieve. When asked about the book fitting in with Infinity War, he had this to say. "That was one of my main goals in the novel and, in fact, was the main reason I agreed to write it! I really hope that certain bits in the book will make people go, Oh, so now that cool scene from that one movie is even cooler! I really wanted to reverse-engineer those moments we've all seen already-in Guardians, in Avengers-and show how we got to them." As for a part in the synopsis, it seems that there might be a spoiler for Infinity War at the very end where it mentions that "a foe whom even a group of remarkable people, pulled together to fight the battles nobody else could, will fail to stop..." We've already been teased about the dark tone of the movie, but that sound downright bleak. Now we'll finally be able to learn the official backstory for Thanos, which will more than likely talk about the gathering of the Black Order as well. Marvel fans looking forward to reading Thanos: Titan Consumed will have to wait until November 20th to read the Mad Titan's origin story, which is pretty far away. However, one of the functions of the book is to bridge the gap between Infinity War and the still untitled Avengers 4, which comes out in May of next year. The book will be available in hardcover, digital formats, and audio book as well. For now, you can check out the rest of the original report about Thanos: Titan Consumed at io9.